gold copper mix cuff, originally uploaded by ebbandflo_pomomama. It's a wire crochet mish mash of copper wire with gold artistic wire and tiny, tiny, tiny glass beads. It's a sneak peek of some of my new Fall jewelry collection. I'm quietly pleased at how my wire crochet cuffs have photographed this year. There seems to be a good mix of macro and lighting to make the wire crochet really stand out. 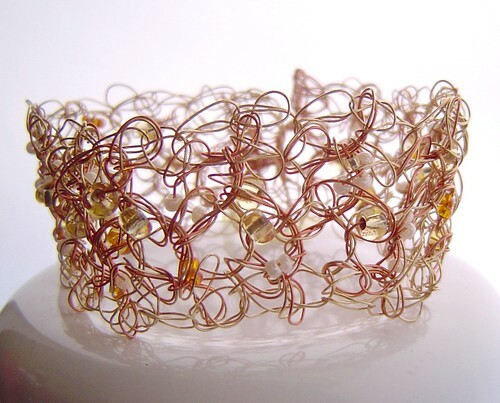 copper and gold wire crochet cuff available here. 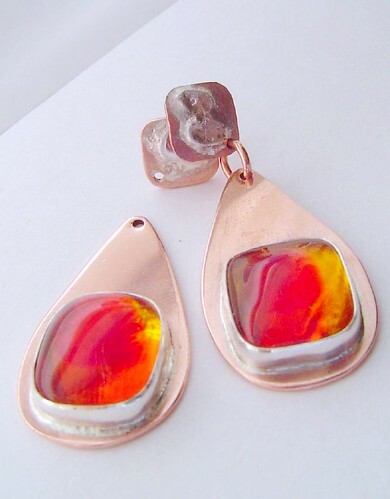 copper and fused glass in Fall colours, originally uploaded by ebbandflo_pomomama. I set the fused glass cabs into the fine silver bezels last night and soldered the posts onto the backs of the fused silver and copper squares. The posts need a good polish before assembling and tumbling. I'm really pleased with the way the glass lights up with the copper. This was my first project from my evening class in jewelry making which has started again. This term it's more of an open workshop format so I'm trying to max out my studio time by preparing new projects to take along. 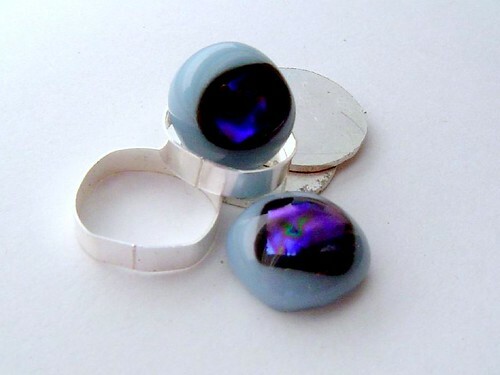 Next on the list is a pair of fused glass cufflinks. I've prepared the bezels for soldering and cut the sterling discs for setting them on. Hopefully I'll get all the soldering done on Tuesday - I can cut and polish at home! My final project is a huge chunky copper ring. Last night I filed and made the cut down on the ring part and prepared the bezel for soldering. 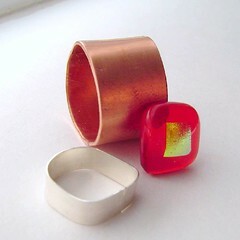 All my projects so far have used fused glass cabs from http://willowglass.etsy.com - it's exciting to be using them in metalworking instead of wiring this year. ... and watch out for pics of the finished articles and where they are listed! a walk in the park?, originally uploaded by ebbandflo_pomomama. 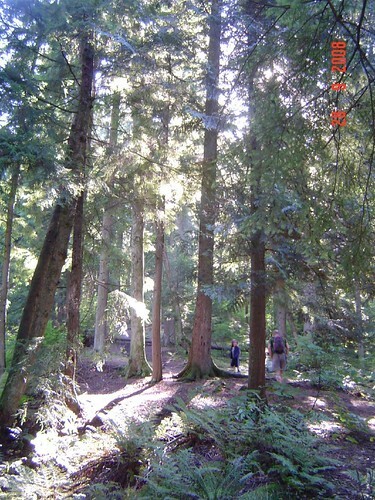 We took a family walk together this morning, looking for the mysterious ghost roads in western Port Moody which show up only on the Google maps of the area. After walking up one ravine then back down the other side we concluded that the Google map is wrong. We didn't meet the family of bears we were warned about. We did bushwhack an under-used trail back down the ravine (not fun, especially for The Wee Guy who is under 4 foot tall and right at prickle and spider web height). The two grown ups fell but The Wee Guy didn't. We did find our way safely back to the car. We had a fish and chips lunch at Pajos. All in all a successful family outing. not quite there yet, originally uploaded by ebbandflo_pomomama. ... the start of evening classes! I'm taking the Intermediate Jewellery Making class our local adult education department, mainly for the open studio access but also because the teacher is excellent. The atmosphere is very supportive with everyone chipping in ideas, instruction and hints for individual projects. So this is my project for the week. 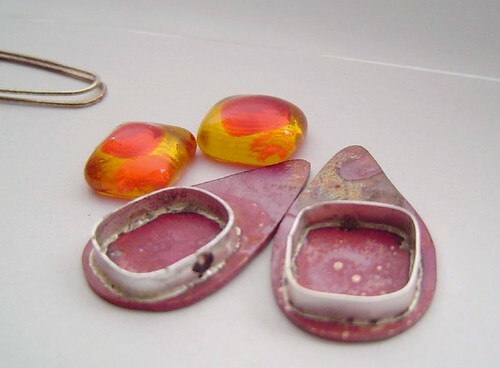 I've soldered a pair of bezels for the gorgeous fused glass cabs I bought from Dee and attached them to two copper teardrops. I'm still not sure if I will cut away the backs to let the light thru or just shine up the copper to glow thru the glass (looks good though I must admit). Just right for my Fall collection of jewelry. PS: I listed some more fine silver wire crochet pieces on icraft and there'll be more to come if you're not a copper fan! Humph! I'm not awfully impressed with the abrupt end of summer this year. Although it's sunning heavily outside this afternoon, delivering The Wee Guy to his morning activity required both a jacket and a scarf before venturing out of the house. Fall is, I know, inevitable but I wish that this year we could have had the same gradual entry system which accompanied my son's immersion into academia. For example, one day I am pratting about in capris and strappy vest tops, and the next I'm reaching for the umbrella and starting to look like michelin man. I would like a gradual introduction to dressing in layers for inclement weather. I would like to transition between seasonal wardrobes seamlessly, with a minimum of "cripes! what shall i wear?" panic moments in the morning. Ideally, continuing with summer dressing with a hint of Fall layering would be ideal and not having to immediately dig out a winter jacket from squished storage. ... but all is not lost! I finished a neck wrap for myself yesterday so I suppose I'm itching for a chance to wear it! May I make a suggestion for your Google Reader list? Try this blog for size and either aspire to be featured or stay the hell away from its pages. Either way, it's an entertaining peek at the world of arts and crafts! proud to announce ..., originally uploaded by ebbandflo_pomomama. ... Becca and Gullible into the family! Becca, female with the brown blaze, and Gullible, white stripe neutered male, are in temporary accommodation until I dismantle some wire shelving to make them a suitable run. Till then, they have free range in my studio while I'm working. 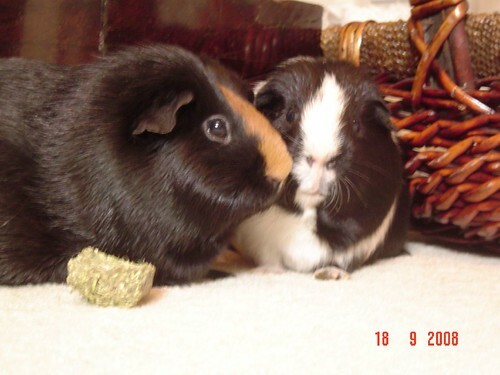 I am one v happy guinea pig 'mum' now! PS: The Wee Guy named them! This morning (Saturday - I'm late blogging this one) I am commuting (so just shut your eyes and drift back to the weekend) to an info session about some writing/editing/publishing certificate programs I'm interested in taking as career developement steps for when The Wee Guy goes to school fulltime ...... and I realise I actually miss commuting! I'm not talking about the tedious length of the journey or the encounters with the great unwashed (people or transit) but the separation that exists between home and place of work. It's one of my biggest bugbears that as a SAHM I am never truly off or away from work - it surrounds me 24/7 with no remission. My only partial respite is if we go away for a holiday and even then the childcare and meal-planning parts of my job description continue. With any length of commute between home and workplace there is an opportunity for contemplation and mental preparation for what lies ahead. A commuter can "rev up" to meet a challenging job or enter "relax mode" during the journey. While I appreciate that many mums who have paid employment outside the home (and indeed women in general, depending on how much help their partners contribute to running the household) may not have the degree of separation I wistfully describe, they do have what many of us SAHMs do not - a physical demarcation of duties. start of the run, originally uploaded by ebbandflo_pomomama. 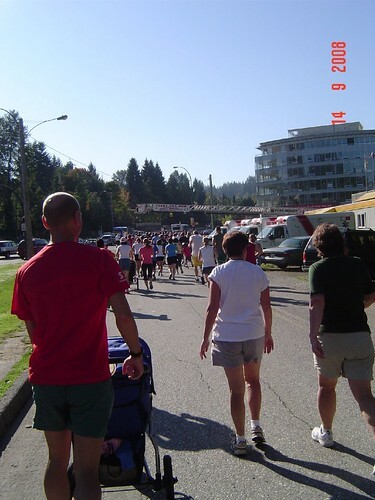 This was our very first Terry Fox run ... and we did it together! Mr ebb filled in an 'in memory' slip for his mum (which brought tears to my eyes!) and we then pushed The Wee Guy around the 3k course. It was a beautifully sunny morning, almost too hot, but so worthwhile. 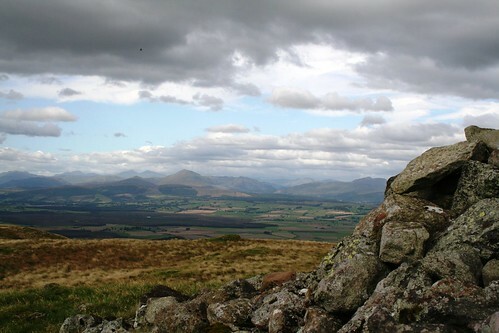 Looking towards the Highlands, originally uploaded by bexybeads. 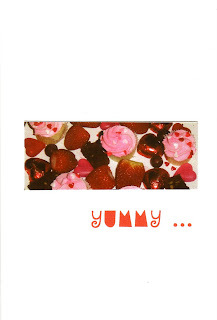 .... and this isn't one of my pics, it's from my lil' sister's flickr gallery. I just wanted to slot it in here so you can see what a beautiful part of the world I moved from to be on the equally beautiful west coast of Canada. Still homesick though - when does that stop? 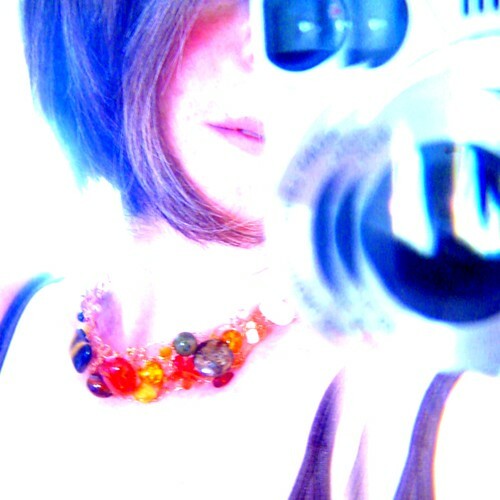 ebb avatar colour manip, originally uploaded by ebbandflo_pomomama. 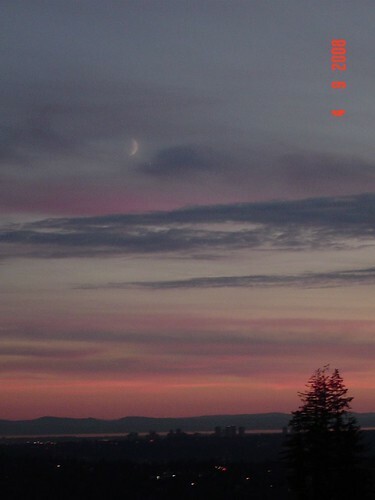 sunset and moon, originally uploaded by ebbandflo_pomomama. This one turned out rather well from last night's photographic exploits (!). Not too much handshake and the manual adjustments on the camera have made the colours really zing. Not much happening blog-wise right now. It's the end of the summer hols and the wee guy is in the middle of gradual entry to kindergarten. He loves it but the whole thing is driving me nuts. Day was half and hour at school, then it's been an hour daily so far. I arrive back home and have to leave to pick him up again almost immediately. My brain is most definitely porridge by now. .... and as for crafting - nada! I have no time. Though I did manage to guest curate an Etsy Finds on slippers which was interesting to do. Had great fun liaising with Anda who invited me to submit my ideas after my little rant about the commercial slippers listed in the Storque a week or so previously. She also did a great editing job and managed to make me seem semi-literate and not quite as much a porridge-brain. ahhhhhhh - am so looking forward to fulltime school, after school care and pre-school activities starting. I really miss my mental faculties after the last 6 or so years! 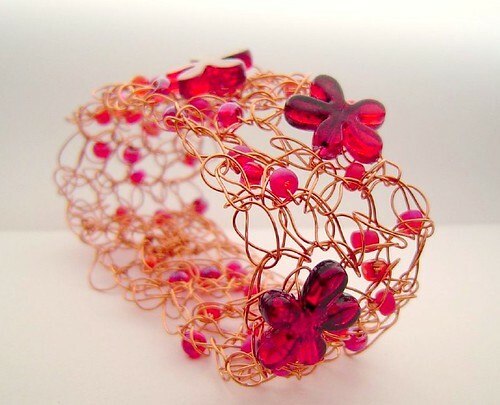 red flower cuff, originally uploaded by ebbandflo_pomomama. I've started working on some Fall designs, featuring copper wire and metal. I made a couple of red flower cuffs last year; they sold well at craft fairs and on consignment. This year's version uses a deeper red flower and similar beads compared with last year's fiery orange. The old image, red flower cuff, was one of my most googled images and provided a large number of hits for my blog. Hmmm . how come I didn't capitalise on this a little more? Can anyone say "newbie"? PS: I'll be listing the Fall previews, including this cuff, in my Big Cartel shop before transferring some listings to Etsy. 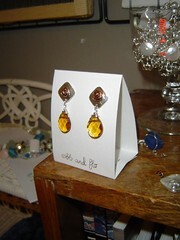 PPS: I've also got some nice amber acrylic flowers which would look awesome with citrine!